Hot Glue just Got Cool with Hot Glue Gun Helpers! This new 7-piece set of craft tools will revolutionize the way you use Hot Glue. Craft mat and tools for working with hot glue. Protect your work surface and your fingers. Use a small drop of glue for tiny gluing. Press into hot glue with no risk of burns. Also works with Mod Podge, acrylic paints, ink pads, shimmer mists, markers, gem glues & tacky glue. You will get 7 Pieces!! 2. Finger Caps (you get 3: 2 adult sizes and 1 teen size): Place on fingers to protect while gluing. Great with hot glue. 3. Tweezers: Pick up and place small items into glue. Non-stick tips. Great for working with gem glue. 4. Paddle: Corners pick up a small amount of glue. Paddle allows for a soft press. Great for gluing flowers. 5. Press Wand: Tipped end smears hot glue. Great for paper crafts. Blunt end allows for a firm press. Great for gluing embellishments. Invented by craft industry veterans and HGTV's Creative Juice hosts, Cathie Filian and Steve Piacenza. After years of burns, they developed the tools to ease you woes and make working with hot glue easier. Tools are manufactured by the trusted company Plaid Enterprises - Mod Podge and FolkArt paints. Thanks for stopping by! Please email/convo with questions. International buyers are always welcome. Cheers to no more burns! 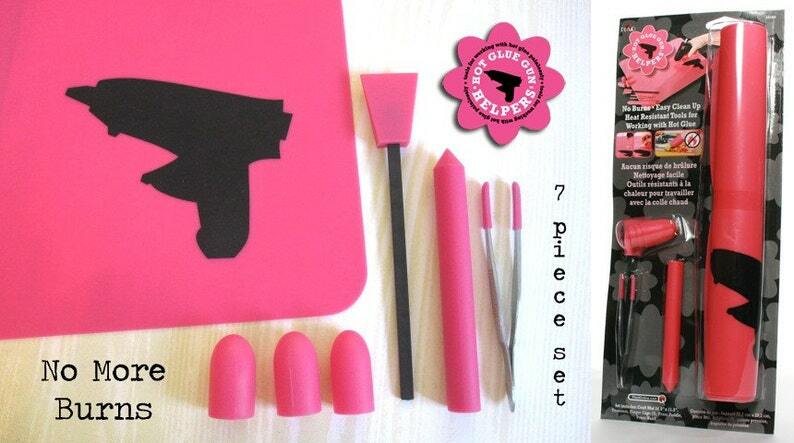 This kit is ideal for anyone who does any kind of making using a hot glue gun. This is my second kit because I loved my first one so much, I wanted to give a second one to a friend who also does a lot of making like me and she loved using my kit. The kit was shipped out very promptly. I was very pleased with everything! It shipped quickly. The only suggestion I have is a larger finger tip that can fit thumbs. Great product! I am really pleased to have found these.